Happy Leap Day! I'm getting a lot of questions regarding the 'cleanse' that I discussed in my last post, so I am going to provide you with some info and tips tonight. I'm on day 3 and honestly it's pretty easy. The hardest part for me is not eating some sort of dessert after dinner. I kill the craving with either berries and cinnamon or a half cup of cottage cheese with a tsp of jam. I always drink peppermint tea to wrap up my night... I just love it. Anyway, most of the questions I am getting revolve around how 'strict' it should be... Here's the thing... I am not about extremes. I believe this 'cleanse' is a great kickoff to a healthier eating lifestyle, boosting energy, and brightening the skin. I've been super busy at work lately and I've had a lot of other commitments so I felt like this was the right week to slow down and eat the cleanest way possible. I don't find it difficult because I already eat similar to the plan. My suggestion to those who find this plan very different from their regular diet, is to modify. Be sure to include berries, colorful vegetables, nothing artificial, and very low sugar. I don't see adding a piece of 100% (has to be 100%) whole wheat or whole grain bread or english muffin to the mix... that's fine. Even some whole wheat pasta, quinoa, brown rice, etc. I understand how difficult this can be, especially with a family, roommates, etc. Just make sure your list includes lean proteins (chicken, salmon, tuna, etc). Stay away from red meats during the cleanse. Keep the list low salt, low sugar and again... include lots of colorful fruits and veg. TIP: frozen fruits & vegetables are well-priced, easy to store, and just as healthy as fresh fruits... sometimes even better. Frozen fruits and vegetables are flash frozen very quickly after they are picked so they stay fresher than say, a tomato making it's way on a truck here from Mexico. Makes sense, right? A few more tips - I understand that it's not easy to stick to a plan like this with a family to feed or roommate pressures, especially at dinner. My advice would be to again, MODIFY. Make the big salad that I included in the last post at the beginning of the week and serve it as a side during dinner for the next few days. Make a side of whole wheat, protein plus pastas, or brown rice, baked potatoes (or frankly, whatever the fam wants) as a side so that they feel like they have a complete meal. You can skip dessert for a few days. The rest of the fam can do what they want. (As a side: My mom doesn't know this yet but I would like to interview her for a feature of her tips in an upcoming blog - I grew up in a healthy household but I was never deprived of the foods I loved... I have received questions from new college graduates to friends my age to friends with big families and kids that have now moved out of the house - I'd like to provide her feedback so that I am connecting with ALL of you!) She's going to laugh when she sees this. Last but not least... Afraid to cook? Just dive in and do it! Nothing I make is really difficult and I'm a much better cook than I was in my early 20's . Email me for tips and advice when you need it. Know the basics and you'll learn - I promise. **During cleanse week - you CAN and SHOULD still exercise. I suggest cardio and lots of stretching. This week should be all about making you feel your best! 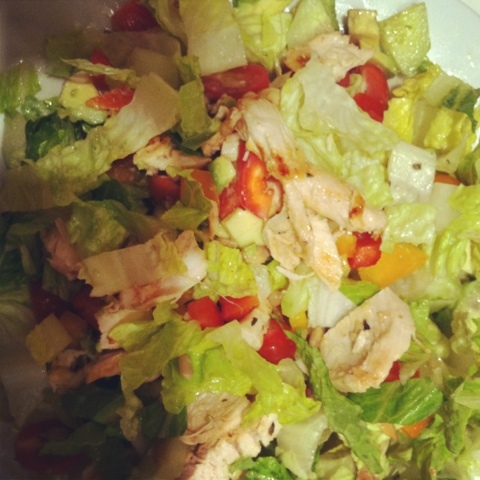 Until next time - check out the salad I made tonight - it's really so good! I promise! It's the same salad I made on Monday only I added a few sunflower seeds tonight - I wanted the crunch! Have a great night everyone, hope the rest of the week goes by without a hitch! Romaine, red & orange peppers, avocado, grilled chicken, cucumber, sunflower seeds, grape tomatoes, and my greek yogurt recipe dressing.